Show "Message Of The Day" in Unix terminal. Usage: generate dynamicaly the /etc/motd file with current information about system resources and usage The original message of the day is now stored in /etc/motd.orig file. Everytime you connect throught the SSH you will see some informations (customisable). It's only for a g33k or adminsys for check some services status in the shell. 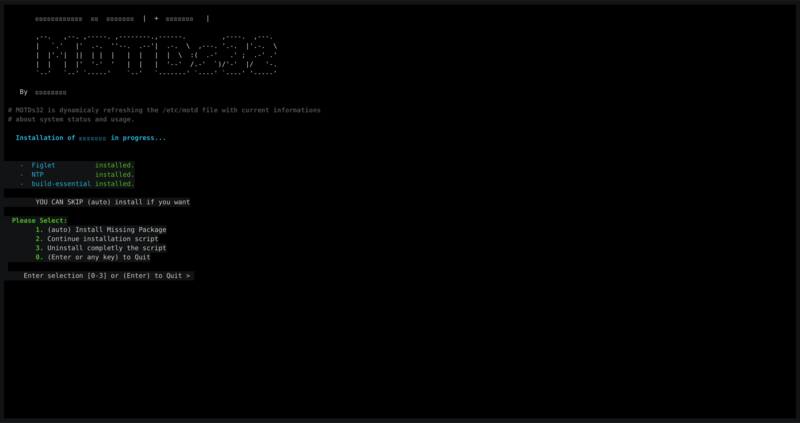 Add a beautifull MOTD for shell bash, each ssh connection and also with bash command. You Need to redownload (git pull) the lastest version form gitlab. Choose option 3 with ./install.sh script !